BRASELTON, Ga. – People northeast of Atlanta now have access to the latest robotic surgery technology, closer to home. Alex Nguyen, MD, a surgeon with Northeast Georgia Physicians Group, performed robotic surgeries on Monday at Northeast Georgia Medical Center (NGMC) Braselton using the da Vinci Xi Surgical System. NGMC Braselton is part of Northeast Georgia Health System, which is just the second healthcare group in the state using the new robotic system. Like the original da Vinci Robotic Surgical System, the Xi is designed for performing minimally-invasive surgery – similar to traditional laparoscopic surgery – that can result in less pain, smaller scars and faster recovery compared to traditional surgeries. Surgeons guide the da Vinci Xi’s robotic arms, equipped with long, skinny surgical instruments and a camera, into the patient’s abdomen or chest through relatively small incisions – sometimes as small as a dime. Then, using a control system, the surgeon views the camera’s real-time feed of 3D HD video and remotely moves the arms to perform the procedure within the patient's body. 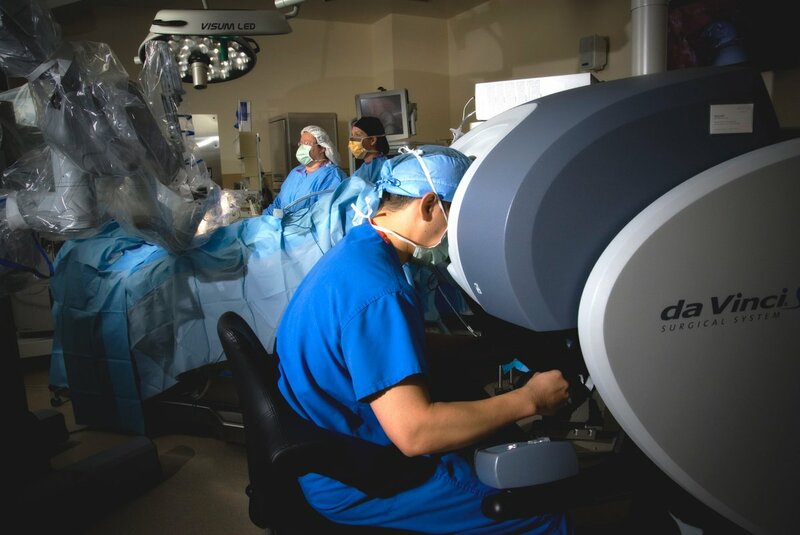 Through the expertise of 20 specially trained surgeons on staff, NGMC’s Robotic Surgical Program has successfully treated more than 2,500 patients across a range of specialties including general surgery, bariatric weight loss surgery, colorectal, oncology and gynecological oncology cases. Learn more and choose a robotically trained surgeon at www.nghs.com/robotic-surgery. Alex Nguyen, MD, operates on a patient with the aid of a daVinci robot. Along with NGMC Gainesville, the two hospitals share a medical staff of nearly 600 physicians representing more than 55 specialties. Both hospitals are part of Northeast Georgia Health System (NGHS), a non-profit that cares for more than 800,000 people in more than 13 counties, with a mission of improving the health of our community in all we do. Learn more at www.nghs.com/braselton.